Where do I use my Greaves Sports voucher code? You’d be hard pressed to find a family business backed with as much heritage as Greaves Sports, operating for the best part of a century and now being directed by its 5th generation of its lineage. Established initially as a rubber company, the firm persevered through the turbulent 30s and 40s - it was then decided by the 3rd generation owners to branch out into the sports trade. Since then Greaves Sports have gone from strength to strength, reinforcing their name as a reputable first rate sportswear retailer; as time moved on more of Greaves Sports’ past competitors made the switch from sportswear to leisurewear, leaving Greaves as one of the last bastions of multi-sports department stores. The next time you’re looking to upgrade your current kit, or perhaps get into a new sport, it’s worth checking out Greaves Sports; their intuitive website makes it easy to navigate and source the correct gear for the job. Browsing through the categories is easy, you can search by sport, gender, kids or brands. If you liked everything else Greaves Sports has on offer then you’ll love their generously discounted general sale. Bag a bargain across a wide range of items and categories - still featuring all of the big names you’d usually pay full RRP. Don’t hesitate, there are savings ranging up to as high as 50% off on clothing, sports equipment, trainers and much more; staggering price reductions on gadget brands such as GoPro and footwear brands like Nike or Reebok! Even better, when your order totals £75 or more - you receive free standard delivery on your items. Do you happen to be in college or university education currently? If so, good news - your studying can be rewarded through a 10% discount on your next Greaves Sports order. All you need to do is register with Student Beans, requiring a valid college/university email address and you’re good to go! If you’re interested in hearing more about any Greaves Sports news, promotional offers, sales or more - then consider subscribing to their mailing list to be first in line. What is the contact number for Greaves Sports? What hours does the line operate? What delivery types are available? Standard – Normally 2-3 working days when ordered before 2pm items will be dispatched the same day. Next Day – Order before 2pm and you will receive your order the next working day. Note: If ordering before 2pm on a Friday your parcel is guaranteed for Monday. Saturday Guarantee – Order before 2pm on a Friday and receive your parcel before 1pm the following day (Saturday). Alternatively, if you work Monday-Friday you may wish to choose to have your parcel delivered on Saturday to guarantee that you will be home to receive & sign for it. Spanning a period of nearly 90 years Greaves Sports has been a leading family run sportswear retailer operating from within Glasgow, priding itself as one of the country’s last true multi-sports department stores standing. Over the years the store has become renowned for its first-rate service, in tandem with its quality and variety of products. Greaves Sports is the one-stop destination for all your sporting needs such as football, rugby, golf or tennis, plus much more; if you’re in the market for general aerobic or resistance training kit, Greaves has an extensive range of training sportswear to facilitate that. 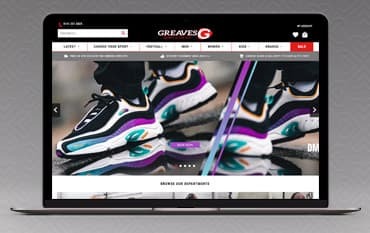 All of the big brands you’ve come to know and love can be found at Greaves Sportswear, names such as Adidas, Barbour, Hugo Boss and Puma - a testament to the company upholding their values through quality products. Ensure you shop with a NetVoucherCodes discount code to get the most for your money when shopping with Greaves Sports.